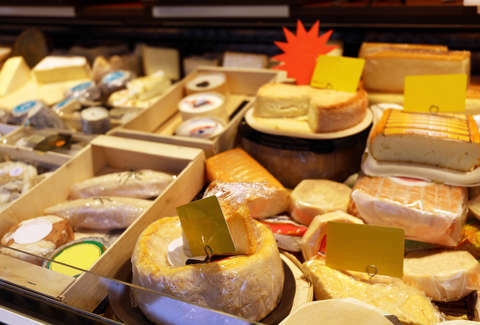 Every cheese fiend can probably tick off a handful of different kinds when put to the test. You've got your cheddar, gouda, American, provolone, and so forth and so on. But it's unlikely you'd be able to match the dairy know-how of one Wisconsin woman, who somehow managed to name a whopping 27 different types of the stuff in under 30 seconds, handily winning an in-game contest at a recent Milwaukee Bucks game. During a televised contest that involved naming as many different types of cheese as possible in 30 seconds, 35-year-old Jamie Kiesl of Mequon, Wisconsin let her Badger State roots shine bright when she rattled off a whopping 27 on the spot before the clock ran out, all while the crowd watched her on the Jumbotron. That was more than enough to beat Bucks player Sterling Brown, who was able to name 17 in the same amount of time (in a pre-recorded bit), earning her a slew of Bucks swag as a prize. Perhaps even more impressive, Kiesl pulled off the feat wearing a cheesehead hat with microphone in her face and holding her 3-year-old daughter. And for those wondering if she had a chance to memorize and prep for the quiz, she did not. She was only told about two minutes before the contest was broadcast that it involved naming cheeses. As for how she knew so many, it's pretty simple. “I’ve lived in Wisconsin my whole life,” Kiesl told the Milwaukee Journal Sentinel in an interview. “There was a moment there where I said to myself, ‘What am I forgetting? What am I forgetting?’ and then I just ran with it." Since the fateful evening, the video the Bucks' account posted of Kiesl going HAM on cheese-naming has been viewed nearly 700,000 times. Is it just us, or are those wine and cheese Advent calendars sounding even better right about now.